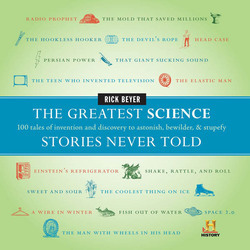 The fourth in Beyer's "Greatest Stories Never Told'' series, published by Harper Collins, the new book includes such tales as the origin of Teflon, Velcro, and the bobby pin; the refrigerator invented without toxic ammonia by a concerned Albert Einstein; the push-button phone developed by undertaker Almon Brown Strowger, who suspected a local switchboard operator of diverting business to a competitor; the work of William Marston, who invented both the lie detector and Wonder Woman; and how Charles Darwin was nearly prevented from embarking on the five-year voyage that led to his theory of evolution when the ship's captain objected to his large nose. Beyer can be heard discussing his book tonight on the "Jordan Rich Show,'' airing at 11 p.m. on WBZ-AM 1030. For more information, go to www.rickbeyer.net. by Cindy Cantrell, Boston Globe "GlobeWest"